We team up with some of the best professional guides in the Northwest to provide you premium sportfishing opportunities. Ridge to River Outdoors is proud to be associated with full time professional guide Jim Stahl. 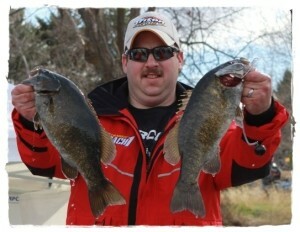 Jim Stahl is the owner and operator of NW Fishing Guides. Jim Stahl of NW Fishing Guides has guided sport anglers in Washington and Oregon since 1998. Jim has extensive experience fishing for Salmon, Steelhead and Sturgeon on the Columbia, Skagit, Skykomish, Snohomish, Snake, Cowlitz, and Wind Rivers. NW Fishing Guides is booking trips now on the Columbia River, Buoy 10, the Snake River & Drano Lake. Jim is a light line fishing specialist. From free-drifting for Steelhead, anchor fishing for Sturgeon or trolling for Salmon, he is always finding new and innovative ways to provide you with a premium outdoor fishing experience. Jim and Jennifer are part of the “information loop” – from articles in NW Sportman magazine to the on-air interviews with The Outdoor Line radio, they know what is going on and where. NW Fishing Guides uses the newest equipment and techniques available, such as G-Loomis rods and Shimano reels. When you fish with Jim, you are fishing from a new 26 foot Willie Raptor with Yamaha motors. Jim maintenance and prep is meticulous and nothing will fail when you hook that fish of a lifetime. Jon Blank is one of the hardest working tournament Bass anglers around. Jon grew up fishing the area rivers on the Olympic Peninsula chasing Steelhead, Salmon and Trout. Later, Jon moved to the Puget Sound area and continued the outdoor lifestyle hunting archery deer and elk and fall upland bird hunting throughout the Northwest for more than 30 years. Jon is actively involved in fishing the Northwest Bass Tournament Circuit where he and his partner placed in the top 5 for Anglers of the Year, and notably winning the Banks Lake Opener in April 2012. Jon has always enjoyed giving back to the sports he enjoys by helping others share in the success he has been blessed with. His purpose is to educate and teach those who want to gain further knowledge of the sport of BASS fishing, upland hunting and dog training, so they can be more successful in the field and enjoy the wonderful outdoors. Jon is fully licensed and insured for sport fishing services in Washington State. Jon runs a new Triton 20 foot bass boat and can take up to two anglers for private lessons BASS fishing area waters. Jon fishes St.Croix rods, Abu Garcia Reels, Vicious fishing line, Vision Hooks & Tackle and more!